, a learned English divine, and able assertor of the doctrine of the Trinity, was born Feb. 34, 1683, at Waseley, or Walesiy, in the Lindsey division of Lincolnshire, of which parish his father, the rev. Henry Waterland, was rector. 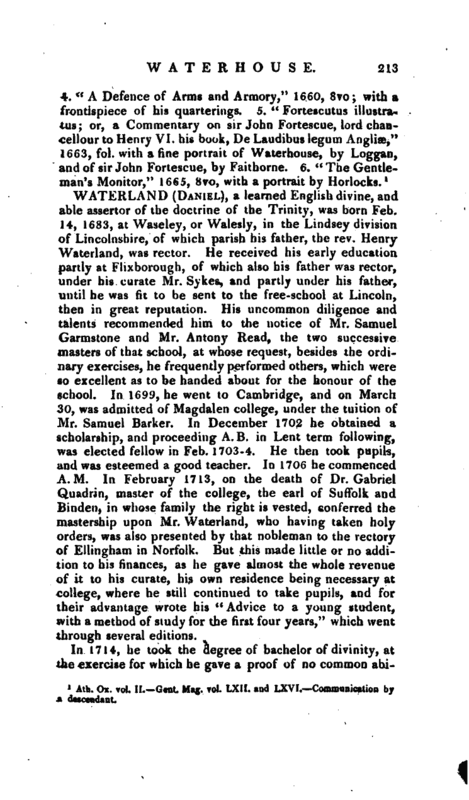 He received his early education partly at Flixborough, of which also his father was rector, under his curate Mr. Sykes, and partly under his father, until he was fit to be sent to the free-school at Lincoln, then in great reputation. His uncommon diligence and talents recommended him to the notice of Mr. Samuel Garmstone and Mr. Antony Read, the two successive masters of that school, at whose request, besides the ordinary exercises, he frequently performed others, which were so excellent as to be handed about for the honour of the school. In 1699, he went to Cambridge, and on March 30, was admitted of Magdalen college, under the tuition of Mr. Samuel Barker. In December 1702 he obtained a scholarship, and proceeding A. B. in Lent term following, was elected fellow in Feb. 1703-4. He then took pupils, and was esteemed a good teacher. In 1706 he commenced A.M. In February 1713, on the death of Dr. Gabriel Quadrin, master of the college, the earl of Suffolk and Binden, in whose family the right is vested, conferred the mastership upon Mr. Waterland, who having taken holy orders, was also presented by that nobleman to the rectory of Ellingham in Norfolk. 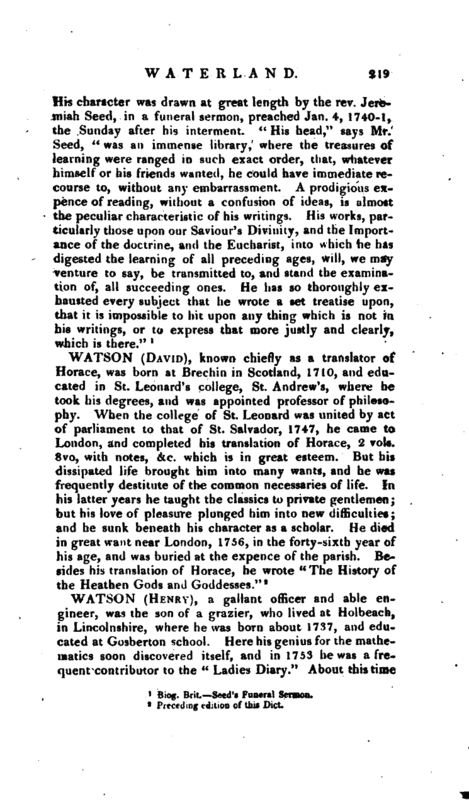 But this made little or no addition to his finances, as he gave almost the whole revenue of it to his curate, his own residence being necessary at college, where he still continued to take pupils, and for their advantage wrote his “Advice to a young student, with a method of study for the first four years,” which went through several editions. In 1714, he took the degree of bachelor of divinity, at the exercise for which he gave a proof of no common | abilities. He chose for his first question, upon which consequently his thesis was made, “Whether Arian subscription be lawful?” a question, says Mr. Seed, worthy of him who abhorred all prevarications, and had the capacity to see through and detest those evasive arts, with which some would palliate their disingenuity. When Dr. James, the professor, had endeavoured to answer his thesis, and embarrass the question with the dexterity of a person long practised in all the arts of a subtle disputant, he immediately replied in an extempore discourse of about half an hour long, with such an easy flow of proper and significant words, and such an undisturbed presence of mind, as if he had been reading, what he afterwards printed, “The case of the Arian subscription considered.” He unravelled the professor’s fallacies, reinforced his own reasoning, and shewed himself so perfect a master of the language, the subject, and himself, that all agreed no one ever appeared to greater advantage. He was on this occasion happy in a first opponent Mr. (afterwards the celebrated bishop) Sherlock, who gave full play to his abilities, and called for all that strength of reason of which he was master. One singular consequence is said to have followed this exercise. I)r. Clarke, in the second edition of his “Scripture Doctrige,” &c. published in 17 19, omitted the following words, which were in his former edition of that book: “It is plain that a man may reasonably agree to such forms (of subscription to the thirty-nine articles) whenever he can in any sense at all reconcile them with scripture.” This is remarked by our author in the preface to his vindication of Christ’s divinity, as redounding to Dr. Clarke’s honour, and it is well known that Dr. Clarke afterwards constantly refused subscription. 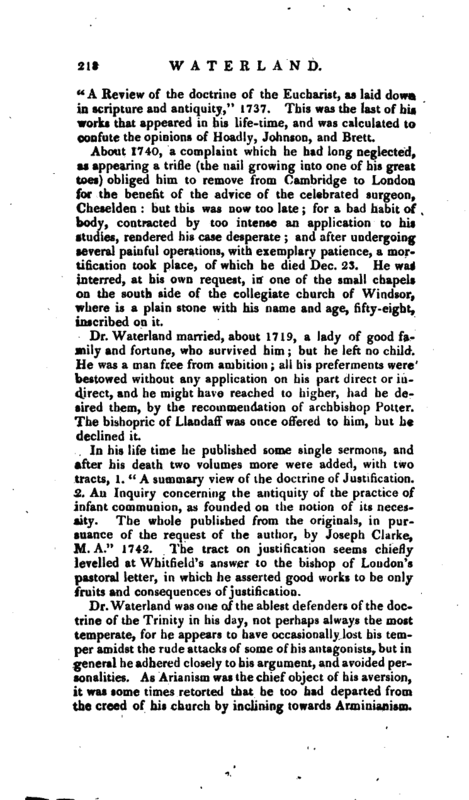 On the death of Dr. James, regius professor of divinity, Mr. Waterland was generally considered as fit to succeed him, but his great esteem for Dr. Bentley, who was elected, prevented his using his interest. He was soon after appointed one of the chaplains in ordinary to George I. who, on a visit to Cambridge in 1717, honoured him with the degree of D.D. without his application; and in this degree he was incorporated at Oxford, with a handsome encomium from Dr. Delaune, president of St. John’s college in that university. In 1719, he gave the world the first specimen of his abilities on a subject which has contributed most to his fame. He now published the first “Defence of his | Queries,” in vindication of the divinity of Christ, which engaged him in a controversy with Dr. Clarke. (See Clarke, p. 409.) The “Queries” which he thus defended were originally drawn up for the use of Mr. John Jackson the rector of Rossington in Yorkshire (See Jackson, p. 420), and it was intended that the debate should be carried on by private correspondence; but Jackson having sent an answer to the “Queries,” and received Waterland’s reply, acquainted him that both were in the press, and that he must follow him thither, if he wished to prolong the controversy. On this Dr. Waterland published “A vindication of Christ’s Divinity: being a defence of some queries, &c. in answer to a clergyman in the country;” which being soon attacked by the Arian party, our author published in 1723, “A second vindication of Christ’s Divinity, or, a second defence of some queries relating to Dr. Clarke’s scheme of the holy Trinity, in answer to the country clergyman’s reply,” &c. This, which is the longest, has always been esteemed Dr. Waterland’s most accurate performance on the subject. We are assured that it was finished and sent to the press in two months; but it was a subject he had frequently revolved, and that with profound attention. 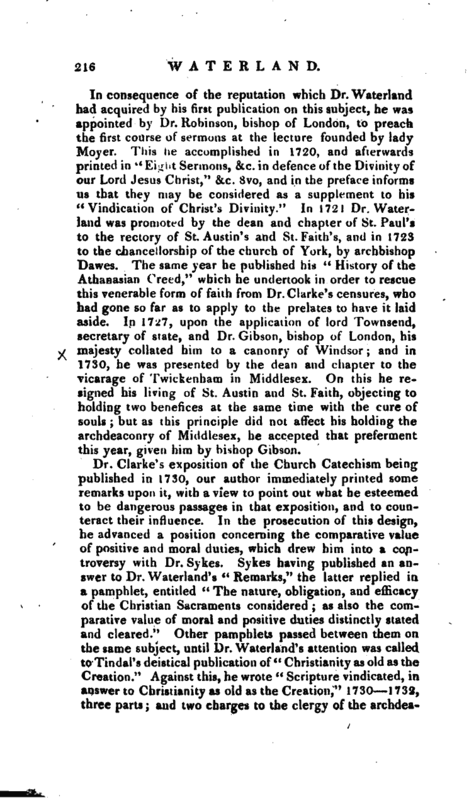 In answer to this work, Dr. Clarke published in the following year, “Observations on the second defence,” &c. to which Dr. Waterland replied in “A farther defence of Christ’s divinity,” &c. It was not to be expected that these authors would agree, as Dr. Clarke was for explaining the text in favour of the Trinity, by what he called the maxims of right reasoning, while Dr. Waterland, bowing to the mysterious nature of the subject, considered it as a question above reason, and took the texts in their plain and obvious sense, as, he proved, the fathers had done before him. 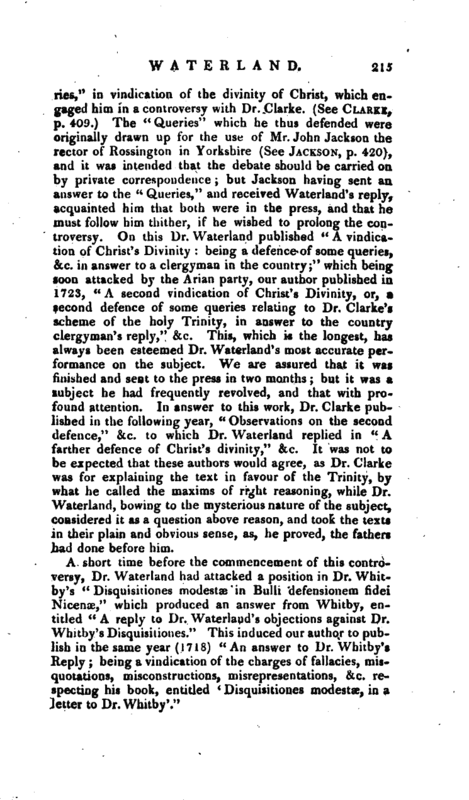 A short time before the commencement of this controversy, Dr. Waterland had attacked a position in Dr. Whitby’s “Disquisitiones modestae in Bulli defensionem fidei Nicenae,” which produced an answer from Whitby, entitled “A reply to Dr. Waterland’s objections against Dr. Whitby’s Disquisiiiones.” This induced our author to publish in the same year (1718) “An answer to Dr. Whitby’s Reply; being a vindication of the charges of fallacies, misquotations, misconstructions, misrepresentations, &c. respecting his book, entitled `Disquisitiones modestae, in a letter to Dr. Whitby‘.” | In consequence of the reputation which Dr. Waterland had acquired by his first publication on this subject, he was appointed by Dr. Robinson, bishop of London, to preach the first course of sermons at the lecture founded by lady Moyer. This he accomplished in 1720, and afterwards printed in fc< Eight Sermons, &c. in defence of the Divinity of our Lord Jesus Christ,“c. 8vo, and in the preface informs us that they may be considered as a supplement to his” Vindication of Christ’s Divinity.“In 1721 Dr. Waterland was promoted by the dean and chapter of St. Paul’s to the rectory of St. Austin’s and St. Faith’s, and in 1723 to the chancellorship of the church of York, by archbishop Dawes. The same year he published his” History of the Athanasian Creed," which he undertook in order to rescue this venerable form of faith from Dr. Clarke’s censures, who had gone so far as to apply to the prelates to have it laid aside. In 1727, upon the application of lord Townsend, secretary of state, and Dr. Gibson, bishop of London, his majesty collated him to a canonry of Windsor; and in 1730, he was presented by the dean and chapter to the vicarage of Twickenham in Middlesex. On this he resigned his living of St. Austin and St. Faith, objecting to holding two benefices at the same time with the cure of souls; but as this principle did not affect his holding the archdeaconry of Middlesex, he accepted that preferment this year, given him by bishop Gibson. 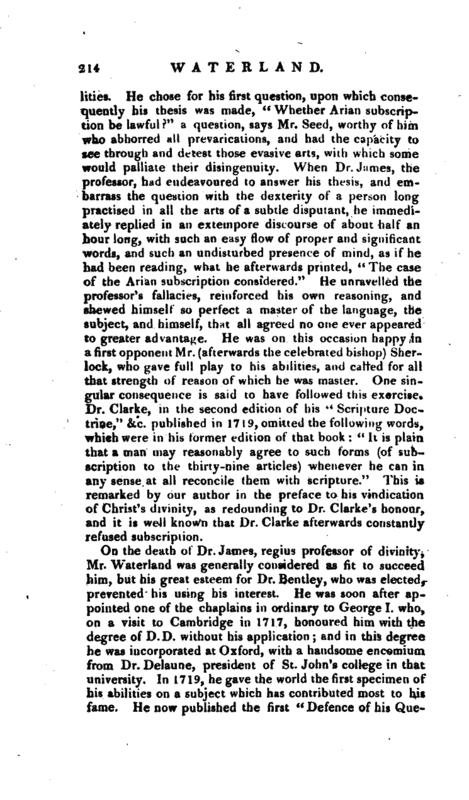 Dr. Waterland had another controversy with Mr. Jackson before mentioned, on account of Dr. Clarke’s “Demonstration of the Being and Attributes of God,” Dr. Waterland undertaking to show the weakness of the argument a priori, which Clarke had thought proper to employ on this occasion. In the <c Second defence of his Queries,“Dr. 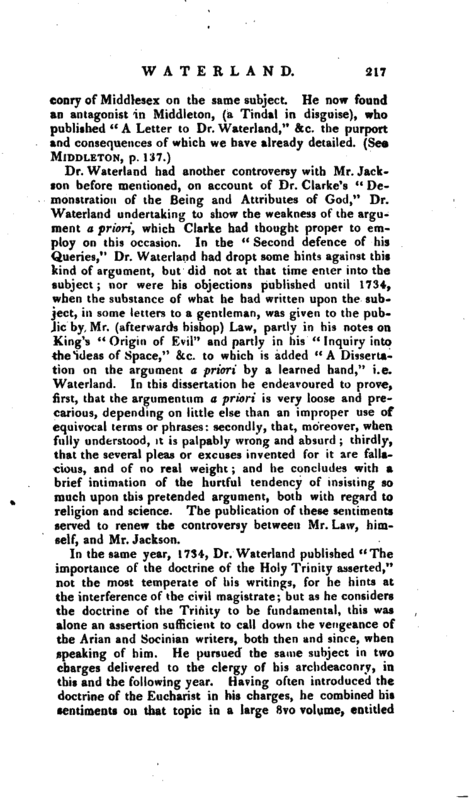 Wateriand had dropt some hints against this kind of argument, but did not at that time enter into the subject; nor were his objections published until 1734, when the substance of what he had written upon the subject, in some letters to a gentleman, was given to the public by Mr. (afterwards bishop) Law, partly in his notes on King’s” Origin of Evil“and partly in his” Inquiry into the ideas of Space,“&c. to which is added” A Dissertation on the argument a priori by a learned hand," i.e. Wateriand. In this dissertation he endeavoured to prove, first, that the argumentum a priori is very loose and precarious, depending on little else than an improper use of equivocal terms or phrases: secondly, that, moreover, when fully understood, it is palpably wrong and absurd; thirdly, that the several pleas or excuses invented for it are fallacious, and of no real weight; and he concludes with a brief intimation of the hurtful tendency of insisting so much upon this pretended argument, both with regard to religion and science. The publication of these sentiments served to renew the controversy between Mr. Law, himself, and Mr. Jackson. In the same year, 1734, Dr. Wateriand published “The importance of the doctrine of the Holy Trinity asserted,” not the most temperate of his writings, for he hints at the interference of the civil magistrate; but as he considers the doctrine of the Trinity to be fundamental, this was alone an assertion sufficient to call down the vengeance of the Arian and Socinian writers, both then and since, when speaking of him. He pursued the same subject in two charges delivered to the clergy of his archdeaconry, in this and the following year. Having often introduced the doctrine of the Eucharist in his charges, he combined his sentiments on that topic in a large 8vo volume, entitled | “A Review of the doctrine of the Eucharist, as laid down in scripture and antiquity,” 1737. This was the last of his works that appeared in his life-time, and was calculated to confute the opinions of Hoadly, Johnson, and Brett. About 1740, a complaint which he had long neglected, as appearing a trifle (the nail growing into one of his great toes) obliged him to remove from Cambridge to London for the benefit of the advice of the celebrated surgeon, Cheselden: but this was now too late; for a bad habit of body, contracted by too intense an application to his studies, rendered his case desperate; and after undergoing several painful operations, with exemplary patience, a mortification took place, of which he died Dec. 23. He was interred, at his own request, in one of the small chapels on the south side of the collegiate church of Windsor, where is a plain stone with his name and age, fifty -eight, inscribed on it. Dr. Water land married, about 1719, a lady of good family and fortune, who survived him; but he left no child. He was a man free from ambition; all his preferments were bestowed without any application on his part direct or indirect, and he might have reached to higher, had he desired them, by the recommendation of archbishop Potter. The bishopric of Llandaff was once offered to him, but he declined it. In his life time he published some single sermons, and after his death two volumes more were added, with two tracts, 1. “A summary view of the doctrine of Justification. 2. An Inquiry concerning the antiquity of the practice of infant communion, as founded on the notion of its necessity. The whole published from the originals, in pursuance of the request of the author, by Joseph Clarke, M. A.” 1742. The tract on justification seems chiefly levelled at Whitfield’s answer to the bishop of London’s pastoral letter, in which he asserted good works to be only fruits and consequences of justification. Biog. Brit. Seed’s Funeral Sermon.